The stapled edges of the distal and proximal ileum are removed sharply. 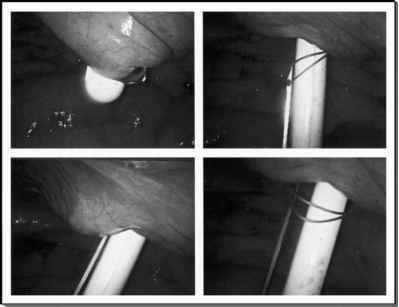 Applications of an endoscopic GIA stapler are used to create a side-to-side, functional end-to-end anastomosis along the antimesenteric border of the small bowel. The open end of the anastomosis is then closed using an endoscopic TA stapler. The end staple line is imbricated intracorpore-ally with interrupted, absorbable suture. The mesenteric window through the mesentery is closed with interrupted absorbable suture to prevent internal hernia formation.